In an electrode boiler AC current flows in water between three or more electrodes. The electrical resistance of the water generates the heat directly. The heat can be used to provide hot water for a heating system or to produce steam for industrial processes. The electrode boiler has been in use in Europe for more than 70 years. It was very popular in the 1960s, especially in countries with substantial hydropower resources (such as Norway). Before the electrical grids in Europe were connected, electrode boilers provided a way of making use of cheap excess power produced from hydro plants during periods of overproduction, and using it to produce hot water or steam. In the 1980s, with improved grid connections between countries and increasing power prices, thermal energy storage became less attractive and electrical boilers declined in popularity, even in Norway. 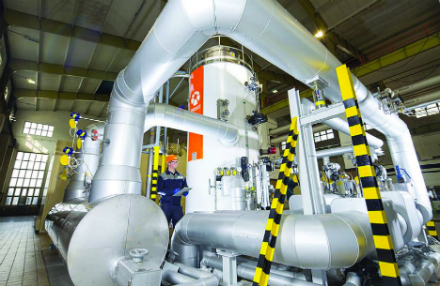 Nevertheless, despite the decline in the market, the Norwegian company PARAT Halvorsen AS took a decision to continue to offer the technology and to keep it as state of the art as possible, providing it for niche applications, eg hospitals that wanted an electrical boiler as back up to complement an oil boiler. The company also delivered an offshore version for an FPSO application (meeting ‘EX’ hazard zone requirements). Subsequently, in around 2010, a new market for the electrode boiler emerged: regulation of grids coping with a growing share of intermittent wind generation. The first inquiries came from Danish municipal CHP facilities, which were required by the Danish grid regulator to install thermal storage to help ward off potential grid instabilities arising from substantial wind capacity on the grid. In Denmark the PARAT Halvorsen electrode boiler was used predominantly for primary grid regulation. In this application, the whole capacity of the boiler is bid in for negative grid regulation. This means when there is too much power in the grid, the boiler will automatically regulate up, achieving its full thermal capacity in 30 seconds, helping to stabilise the grid frequency. The electrode boiler, with its minimal pipework and no heating surfaces, is particularly suited to this kind of fast ramping. In other countries, notably Germany, a market developed for the electrode boiler in negative secondary regulation applications, ie absorbing power from the grid, but over longer time frames. Another market is CHP power plants that face a situation where delivering heat to district heating gives better revenues than selling power. They can use the electrode boiler to convert their power to heat instead of delivering cheap power to the grid. The electrode boiler can also be used for internal load regulation in multi-unit CHP plants when starting or stopping a unit, allowing the load on piston engines or gas turbines to be maintained at an optimal level. Some users in addition find that an electrode boiler can form a valuable part of the backup plan if gas supplies or other parts of the infrastructure should fail. In those circumstances, the electrode boiler can deliver district heating or steam to critical clients. The electrode boiler can reach full load from cold conditions in 5-10 minutes, which is advantageous for a backup boiler. In Norway, users employ the electrode boiler because electricity is competitive with oil and gas as a source of heat. Using electricity also improves environmental credentials. The PARAT electrode boiler consists of an outer and an inner container. The electrodes are suspended inside the inner container, which is electrically insulated from the outer shell. The water and the inner container forms an insulated zero point in the star connection between the electrodes. A circulation pump brings water to the electrode container. The output of the boiler is proportional to the water level at the electrodes. A traditional fired boiler needs a combustion chamber and a tube section to transfer heat from the flame to the water. This results in large, heavy and costly construction. In the electrode boiler heat is generated directly in the compact water volume between the electrodes. The electrode boiler uses medium voltage, in the range 6-24 kV. Unlike a typical low voltage heater, it doesn’t need a low voltage transformer, so the costs associated with the transformer, cabling and low-voltage switchgear are avoided. The technology of the electrode boiler is well established and well understood, benefitting from many years of experience. The highly reliable electrode system currently in use was developed by PARAT Halvorsen in 1993, in collaboration with the University of Trondheim. The previously used electrodes tended to suffer wear and tear due to high current fluxes and had to be replaced frequently. Building on practical experiments and computer simulations, the symmetrical PARAT electrode concept was developed. Current fluxes were brought down to a level where the electrodes no longer experienced excessive wear. In response to the growth in renewables, becoming a significant part of power production, the electrode boiler has been undergoing continuous development. The 24 kV version was developed in 2015 and is now in successful operation at four plants. The control system of the boiler has also been improved and response times reduced to enable the boiler to perform the demanding task of primary regulation. The capacity range of the PARAT electrode boiler is 5-60 MW. PARAT Halvorsen AS was the first company in the world to deploy a steam electrode boiler for grid regulation. In Germany there is now more than 250 MW of PARAT steam boiler capacity deployed in this application. A project at a Currenta-operated site in Leverkusen, Germany (see picture, above left), is a good example of how a 7 MW electrode boiler can be integrated into the steam grid of an industrial park. The boiler is bidding for secondary regulation, and when it operates, less gas and coal can be used for steam production. The electrode boiler at Leverkusen delivers saturated steam at 32 bar g, and the low voltage super heater brings the steam temperature up to 380°C. Also pictured (above right) is a 15 MW electrode boiler employed in a power- to-heat project at ŠKO-ENERGO’s power station in Mladá Boleslav. In this case the PARAT electrode boiler is coupled to a heat exchanger that feeds the heat generated into the existing district heating system, providing a buffer during peak loads in the public power grid. The power plant was designed jointly by ŠKO-ENERGO and E.ON Czech Republic. Another recent installation (see right) was a PARAT Halvorsen 10 MW high voltage electrode boiler for A2A Calore e Servizi, Italy’s largest district heating company. The boiler was commissioned in early 2018 and it will be used for peak load and grid regulation in Milan. PARAT Halvorsen is always looking for innovative ways to develop the electrode boiler. A recent award from Statoil will, for example, see the delivery of a 2 x 12 MW 11 kV electrode boiler heating system (skid mounted) to the Johan Sverdrup Phase 2 field. The offshore field is to be entirely operated with renewable power transmitted from the Norwegian mainland, rather than the usual platform mounted generating sets. We also believe that the renewables business currently faces a challenge that electrode boilers could help address. Since we entered the market for grid regulation in 2010 we have seen significant growth in renewables on the European power grid. However, when we travel around we notice that many wind turbines are idle, even in windy conditions. The reason for this is mainly old fashioned tax structures that discourage the use of electricity as a heat source or high grid tariffs even when the grid is not busy. For such reasons many GWh of renewable power is wasted every day since it is never produced. So we direct our challenge at politicians to work as hard at establishing a suitable framework for using renewable energy as they did to get renewable generating technology installed.